The Victorian Rainforest Network is a group of "...rainforest enthusiasts, researchers and activists with a shared interest in rainforest conservation and education across Victoria." 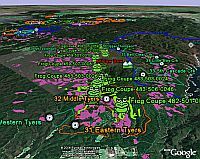 They have put up an extensive collection of Google Earth content to provide information on the rainforest environment, water sources, endangered species, and the issues of logging in these public lands. These two files here and here show an overview of the rainforests of interest in the area. 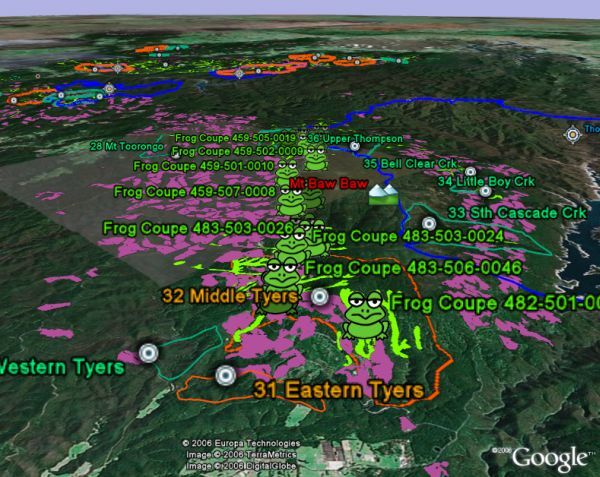 Some of the Google Earth content is intended for use in schools and for young people (such as the one about the endangered Baw Baw Frog which tells the story from the perspective of the frogs). They also have information about logging in the area and issues with the government not doing an adequate job (in their opinion) to protect the lands. What I like is they are using Google Earth (and its satellite/aerial photos) to document evidence of damage and inappropriate logging. You can view most the information and get some basic instructions on their GE page here. But, there is more information on other pages as well. This is the most extensive use of Google Earth for an environmental cause I've seen so far.